The strongest division ever? That is the widely held view of the new season’s National South, as Eastbourne Borough look to hold their own against an array of big-spending opponents. Frankly, you have to run to stand still. Howell’s playing budget is modest, but not bargain-basement. Yet all around him, opposing clubs pitching for glory are outspending him. This could be a season for strong nerves. What’s in a name? Torquay United are the latest former Football League club to fall from grace. Defeated by Borough, back in the Conference Premier days, in one of the great performances by a Garry Wilson side – and with Ashley Barnes netting twice – the Gulls have stayed full-time and will be desperate for success. 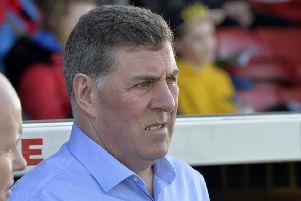 Woking, relegated on the final day of last season, are nursing injured pride, and with canny Geordie Alan Dowson now in charge they should be competitive. And then the newer names. Billericay have got rich very quick, rising from the Bostik League on Glenn Tamplin’s massive funding. Some estimates put his wage bill at over £30k a week last season, but the word is that this season it is slashed to a “mere” £10k. Journeymen they may be, but well-paid, experienced, and capable of a second promotion. Dulwich Hamlet, hugely supported and highly regarded as a proper non-league club, may be too preoccupied with ground ownership issues but they will comfortably hold National South status. Add to the mix Dartford and Chelmsford City, both thwarted in last season’s play-offs, and Steve King’s Welling United, with fresh funding from owner Mark Goldberg. Throw in ambitious Wealdstone, dark horses Slough Town and persistent under-performers St Albans City, and the battle for those seven play-off places already looks like a funnel of kids clamouring at the ice-cream van.But it cuts both ways. Some of those competing clubs will be elbowing each other, taking points off each other. And from mid-table to play-offs may be quite a short hop, for the perennial mid-tablers such as Bath City, Hampton, Truro and Hemel Hempstead. Even traditionally smaller clubs like Concord Rangers and East Thurrock are raising the budgets and raising their sights. But every season brings fresh big-spenders – who don’t always stay the course – and fresh surprises. What is lacking this year is a bunch of obvious strugglers. It is not negative thinking, on Borough’s part, to look to maintain National South status as a minimum target. That means taking points, and plenty of them, against the more modest opponents: Hungerford, Chippenham, Weston and Gloucester City. Saturday’s opponents Oxford City – and no, that one isn’t really a six-pointer. Eleven against eleven may be a cliché, but it remains true. Opponents do not score goals against you because they are famous/lavishly paid/drive a Maserati/have an agent who talks them up (delete as appropriate). They score if, and only if, you let them through. Eastbourne Borough have never been starry-eyed or star-studded. But Jamie Howell has a squad, slightly short on bodies, but not short of either experience or ability. They are fighting fit and desperately eager to win for the cause – and, who knows, to prove a few doubters wrong.